OCZ Technology Group, Inc. (Nasdaq:OCZ), a leading provider of high-performance solid-state drives (SSDs) for computing devices and systems, today announced the immediate availability of the OCZ-SANRAD VXL enterprise storage accelerator, delivering flash caching and VMware acceleration for virtualized environments including VMware® ESX and Citrix® Xen. OCZ-SANRAD VXL drastically alters the available options for storage in the enterprise datacenter by allowing any PCIe-based OCZ Z-Drive R4 model including the newly introduced Z-Drive R4 CloudServ™, to be utilized as a accelerator for traditional iSCSI and FC storage. This eliminates the need for costly tier-1 SANs in a wide range of enterprise IT infrastructures from application virtualization to virtual desktop infrastructure (VDI). As part of this launch, OCZ will be arranging live demonstrations on-site with enterprise customers to showcase how data can be accessed by virtual machines up to 25 times faster than a traditional SAN alone, while also allowing seamless migration of virtual machines from one physical host to another without loss of access to the flash cache or a cliff-like performance drop. 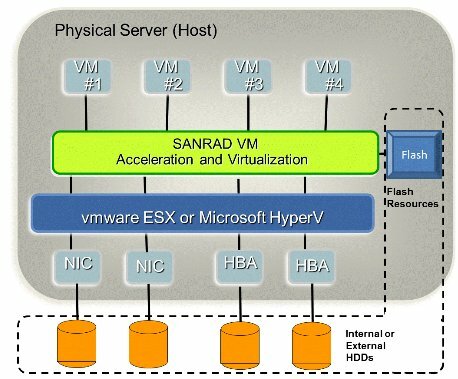 As an example, in virtual desktop infrastructure, VXL and the Z-Drive R4’s flash based storage is able to complete boot storms of hundreds or even thousands of users significantly faster than what is achievable with typical SAN storage. VXL fully supports VMware vMotion™, and guarantees cache migration where cached data is treated as a virtualized storage entity and can be migrated between VMware ESX servers along with the virtual volumes without performance loss. For ESX, Microsoft® Hyper-V™ and Citrix XenServer™ hypervisors, VXL does not require separate operating system agents to be installed in each virtual machine like other solutions, simplifying IT management and deployment from one central system. VXL ensures automatic support for any OS supported by the hypervisor including all modern versions of Microsoft Windows®, all major Linux distributions, OpenSolaris™, and FreeBSD among others. VXL provides robust tools for enterprise IT management including integration with VMware vCenter™ virtualization management console, as well as Storage Pro software for remote consolidated management of any OCZ Z-Drive R4 and CloudServ in the datacenter. Additionally, VXL provides dynamic policy-based caching tuned specifically for critical applications including Microsoft Exchange, Microsoft SQL Server, and other enterprise-class server applications. With these enterprise IT management features, VXL transforms the way storage is managed in the cloud and in enterprise-class datacenters.